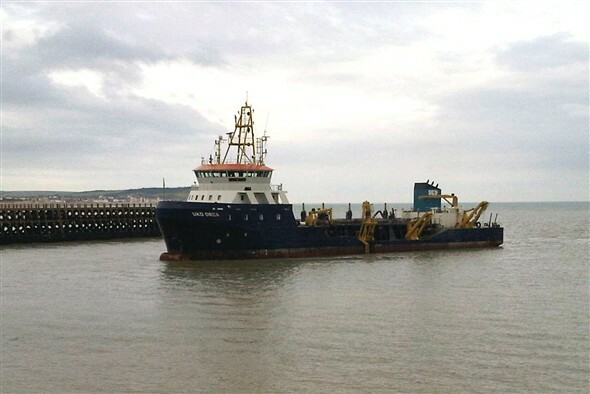 The task of for dredging Newhaven's main entrance channel, carried out for so long by Westminster Dredging, is now carried out by UK Dredging, and their trailing suction hopper dredger UKD Orca is seen here dredging between the piers on 3rd July 2012. She was moving incredibly slowly and precisely, her movements being controlled by GPS navigation and her system of twin rudder-propellers and a bow thrust unit. High tech indeed, back in the days of the bucket dredger Foremost Prince, it was all done with local knowledge, a lot of experience and a good pair of eyes! This page was added by Andy Gilbert on 11/07/2012. I'll bet she was a lot quieter than the Foremost Prince too. One of my lasting memories of the harbour will always be the cacophonous mixture of squeals, groans and rumbles, from the bucket chain, as gobs of silt slithered down the chute into the waiting "mud barge". As a small boy, I used to stand in catatonic fascination, watching the dredger in action. It took several sharp tugs and a clipped lug to get my attention back to "going for a walk down the river wall." Its one of the sounds of Newhaven along with the foghorn that I will never forget. Even when we moved to Denton I could lie in bed and hear the dredger, you knew if the foghorn was going it was going to be a cold cycle ride to work, the Drove was a long way in the fog.